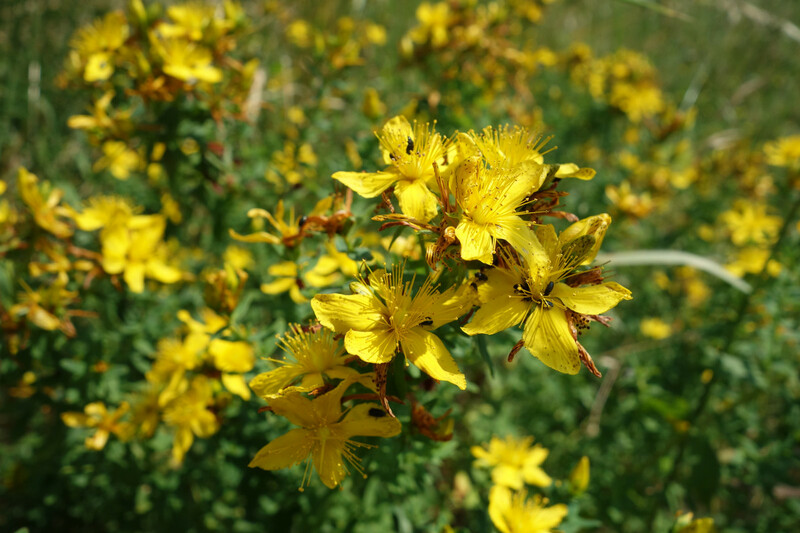 Perennial herb, up to 1m tall, native to Europe, West Asia; stems erect from creeping and rooting base; leaves narrowly elliptic to narrowly oblong or linear, yellowish-green with abundant translucent dots, main lateral veins 2-paired; inflorescence 3- to numerous-flowered, flowers stellate, petals golden yellow, black glands few on sepals and petals. The EtOAc extract of H.perforatum contained flavonoids (rutin, hyperoside, isoquercitrin, quercitrin, quercetin and biapigenin, 1.75%), hypericins (hypericin and pseudohypericin; 0.13%) and hyperforins (hyperforin and adhyperforin; 0.77%). Hyperforin-induced nonselective cation influx is blocked by TRP channel blockers in PC12 cells.